Observables will be showcasing their all-new “Server Room Monitoring Kit” – a package that contains all of the items necessary to keep an eye on small server rooms. The kit includes an IOBOT Base – to enable network scanning, device detection, firewall, and cyber security functionality. The kit also includes two video cameras and a motion sensor, so you can monitor the physical security of the entrance to your server room and the interior of your server space. Physical security is enhanced with an access control keypad, cards and electric strike are also included. Keeping your servers and other networking equipment in an optimal environment is critical to their longevity and continued operation, so sensors for temperature and humidity are included. 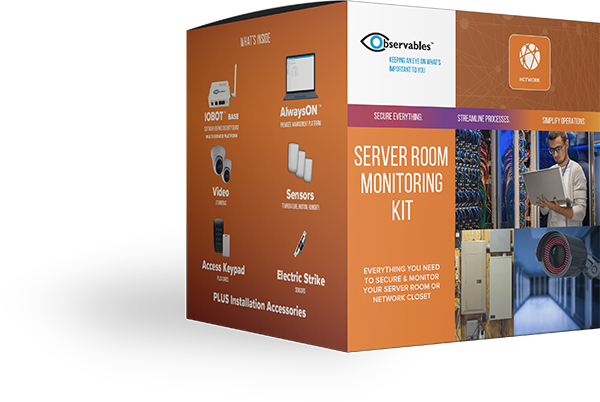 The Server Room Monitoring Kit also includes all accessories needed to install this solution. This kit offers full physical and cyber security for full situational awareness in any small to midsize business server room or closet. It’s high security and brings recurring revenue opportunities to MSPs, VARs, and IT integrators.